Quinoa-stuffed green peppers | Mmm, Tasty! Tonight’s new (for us) ingredient: Quinoa! KEEN-wah! Quinoa is a whole grain which Wikipedia describes as “mild and nutty”, which is also how Wikipedia would describe me were I not, as they say, “non-notable”. 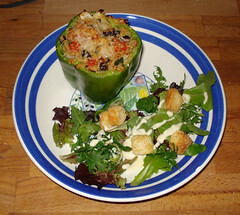 The results were very good, although were I to do it again I’d do it in a red pepper. However, we took the article’s advice and cooked up a big batch of quinoa to refrigerate and use later, and there’s now about three quarts of quinoa in a pot on the stove for which we’ll need to find a use. (Later on EO: “So sick of quinoa!”). It’ll be interesting to see how it fares next week substituting directly for rice and pasta (as well as in some of the other ideas in that article).